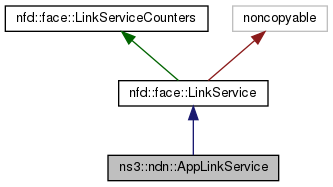 Implementation of LinkService for ndnSIM application. Definition at line 41 of file ndn-app-link-service.hpp. Definition at line 35 of file ndn-app-link-service.cpp. Definition at line 44 of file ndn-app-link-service.cpp. Definition at line 79 of file ndn-app-link-service.cpp. Referenced by ns3::ndn::ConsumerZipfMandelbrot::SendPacket(), and ns3::ndn::Consumer::SendPacket(). Definition at line 85 of file ndn-app-link-service.cpp. Definition at line 91 of file ndn-app-link-service.cpp.